I am lucky enough to host this week’s Watercooler Wednesday Challenge 158 – Helen’s Masculine “Anything Goes” Challenge. 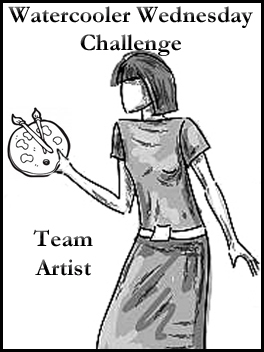 For this week’s male challenge, I decided on another stamp set from Art Impressions – Any Cake Set. After water colouring the faces stamp with Distress Inks, I painted in a basic background before, fussy cutting sections to fit inside the Mama Elephant window die (after removing the centre window panes). I also stamped the Art Impressions – Cake Promo stamp and a sideboard from an old wood block stamp, I had picked up years ago on a throw out table. After adding a piece of Designer paper, I attached the window and a cut down section of sideboard and cake with raised tape. To finish, I added a sentiment die from Simply Dies on fun foam. I love the way the fun foam adds dimension to a die cut sentiment and helps it to really stand out. Thanks so much for stopping by and please be sure to check out all the wonderful creations from the rest of the team on our blog. Helen, we think the way you made the Any Cake raccoons peek into the living room is just adorable! And we appreciate your no-line coloring, too! The sweetest little scene Helen, I think maybe we should get together… you have some of the bestest stamps! What a terrific collection of stamps you’ve rounded up for this wonderful card Helen. AI stamps are always so much fun. I love these little raccoons, and the scene you watercoloured behind them. You’ve really created quite the scene in the room too and beautifully coloured it. Thanks so much for sharing your talents with our team Helen, you really rock it every time! Thanks for sharing with us at HLS for our AG with Dies Challenge. You are so clever!!! Oh my gosh, I absolutely LOVE this card!! Fantastic creativity building this cute scene! Love it!!! Thanks so much for joining us at Art Impressions! Your card is fabulous! I really love how you colored the raccoons! They look so cute looking in on the cake. Thanks for joining the Anything Goes Challenge on the Art Impressions blog. Omgeeee, what an adorable scene and awesome colouring! 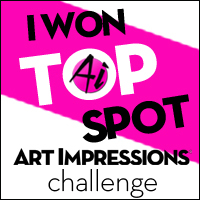 Thanks for playing along with us over at Art Impressions! Helen I saw your card and fell madly in love with those adorable raccoons. I suspect they’re more about the cake than about actually celebrating the birthday, but they add so much fun to the gorgeous scene you’ve created. Wonderful colours. Great work! You’re very kind, Heidi. It was fun to play with the stamp set and do something different! Lots of fun!